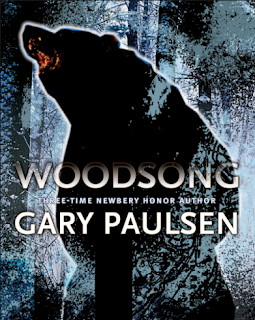 'Woodsong' is the memory written by American author, Gary Paulsen. It is about the author’s experience of living in the wild. Gary Paulsen described the years when he and his family lived in the woods in the northern part of Minnesota, the USA. The forest had plenty of wild animals such as wolves, deers and black bears. They also held domestic animals like cats, dogs, chickens, ducks and geese. It was strange that the bears would steal meat put out for dogs in the kennel, but they never attacked the yard animals. The author admitted that it must be a rule, a part of the bears’ natural instinct. There was a large bear, who wandered around the house. It had a white streak across his head. It would be a result of wounding him by some hunter. Gary Paulsen called him Scarhead. It was a terrible, fatal mistake. Gary was awarded it instantly when Scarhead jumped at him stopping very close to Gary. "Close. I could smell his breath and see the red around the sides of his eyes. Close on me he stopped and raised on his back legs and hung over me, his forelegs and paws hanging down, weaving back and forth gently as he took his time and decided whether or not to tear my head off." The bear stood above Gary and after that, he lowered himself down and he turned back to the trash. The narrator described how the anger grew inside of him, how he ran to the house and took a rifle, coming back to the yard and pointing to the bear ready to kill him. But awareness of what would happen came to Gary. "Kill him for what? That thought crept in. Kill him for what? For not killing me? For letting me know it is wrong to throw sticks at four-hundred-pound bears? For not hurting me, for not killing me, I should kill him? I lowered the rifle and ejected the shell and put the gun away." The story introduces the idea of living in peace with nature. The wildlife is severe, we need to understand and respect its rules. The author wished this bear a long life and concluded: "I am nothing more and nothing less than any other animal in the woods."